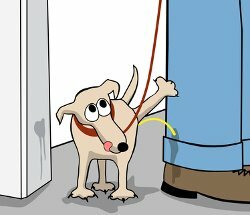 Adolescent Puppy Behavior - How To Live With A Teenage Dog! 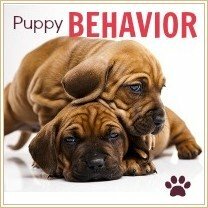 Adolescent puppy behavior is often challenging, and can be unpredictable, confusing and downright difficult. For everyone. When that tiny ball of fur you brought home just the other week (or so it seems) suddenly hits the 'teenage' stage it can be a bit of a shock, especially if you didn't realize that puppies even became teenagers! 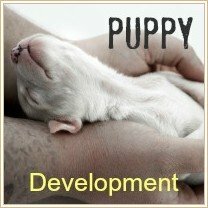 It's a developmental stage that your puppy has to pass through on the way to adulthood, and to make sure you both survive it this page covers the type of behaviors you can expect from an adolescent pup, and how to handle them in a way that will help him to learn and grow in a positive way. This is oh so true... and if you've raised the two-legged variety then you will have less trouble with the four-legged one. Humans formally reach the teenage stage when we first tack 'teen' onto their ages, but not every child matures at the same rate, and neither do puppies. Not all dog breeds develop at the same speed but there is a predictable order to puppy development, both in physical growth and emotional/sexual maturity. The adolescent stage in puppies can start as early as four months of age for smaller breeds, and usually around six to nine months for the larger ones. It pretty much lasts until your pup reaches maturity physically, sexually and emotionally. Small breeds mature much faster than large or giant ones, and all their growing is pretty much packed into the first year. Your little dog may be a teen by four months, a young adult by eight months and an adult before he's fully a year old. Your big little 'un won't reach the teenage stage until he's around eight to ten months old, and will linger there for longer, maybe not being totally mature and adult he's somewhere between eighteen months and three years old . Puppy Adolescence Is Easy To Recognize! When you think 'teenager' what behavior traits come to mind? As a mom who's raised six kids through adolescence, and more puppies than I can count on both hands, (and survived).... I can vouch for every one of the above behavior issues showing it's face at some point during the teenage stage. Not ALL puppies will become different, and difficult, during with this adolescent puppy stage. Some sail through it with barely ruffled fur, others turn into Attila the Hun and cause havoc. There's no way to tell how your little one is going to handle adolescence until he gets to it, but there is always the reassuring fact that this stage does end, eventually. He suddenly develops 'selective hearing' - ie he only hears you when he wants to! During adolescence, your pup will become sexually mature (this is NOT the same as developmentally mature!). His/her hormones will rise dramatically, peak, and then slowly descend until they reach stable, adult levels at maturity. 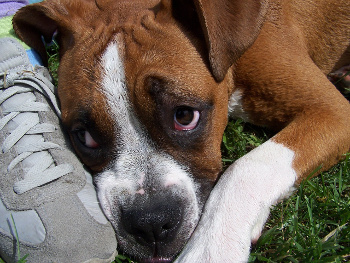 Neutering or spaying your pup can help to reduce hormone-related behaviors. For small breeds, it's recommended that either surgery be done before six months of age. Although currently the formal guidelines remain the same for larger breeds I personally think that it's a good idea to wait until a pup is a little older before spaying/neutering (perhaps 8 - 10 months). A teenage puppy can be a frustrating little creature... but inside all that ornery-ness is the same, lovable, sensitive pup that you've come to know and love. He's just covered with a really tough outer shell right now! We all remember being teenagers right? It's not an easy time and can be filled with doubt, anger, confusion, anxiety and frustration. Fido feels the same way. His hormones are raging and his body/brain are going through some pretty heavy-duty changes. He feels all sorts of different (and unfamiliar) emotions and he doesn't know how to handle them properly yet, or what they mean. When you realize this it makes it easier to be calm, patient and understanding with a puppy who's in the throes of a teenage tantrum, or doing his Dr Jekyll/Mr Hyde impersonation. Just try to remember that adolescent puppy behavior is simply Fido's way of trying to exert some control over his life and show how independent and grown-up he is..... it's a natural instinct to act this way. He's not on the way to becoming a juvenile delinquent, he's not an 'aggressive' puppy and he's not a hopeless case. He's just a teenager! Bringing home a new puppy is a big commitment in terms of time, effort, money, patience, love and more. That commitment doesn't end when he grows out of the adorable, butterball baby puppy stage! 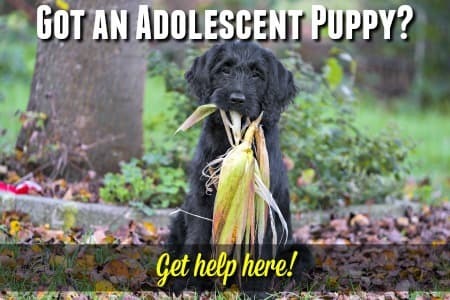 Your adolescent puppy needs all the same things from you in order to grow into the happy, stable, friendly and well-behaved dog that he is meant to be. Now he's no longer a baby puppy, Fido is going to sleep less and have energy to spare. Regardless of his size he'll be on the go and if you don't give him enough physical exercise and mental stimulation, he'll find ways to use up that energy that you'd rather he didn't! Regular walks, backyard games, daily training sessions and mentally-stimulating toys will all provide positive ways for your pup to exercise his brain and his body, making both him and you happier. 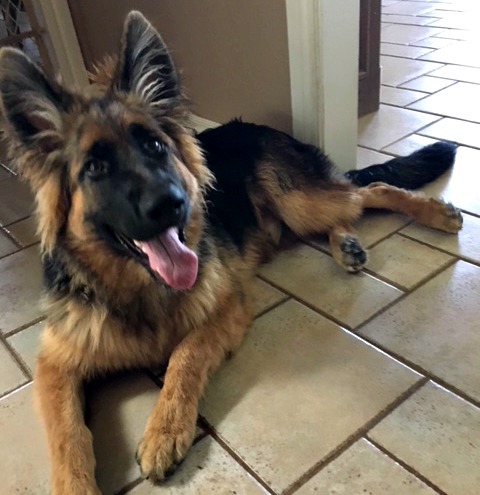 My GSD puppy, Dax is pictured above practicing his 'down-stay'. He looks calm in he photo, but he's actually a whirlwind of energy, sort of like having a pony with ADHD as a permanent house guest! He's a large breed puppy so I know this adolescence thing is going to be around for a while, but I love him a ridiculous amount so it's not a hardship to put up with his teen antics. He will grow out of this stage, sooner or later. 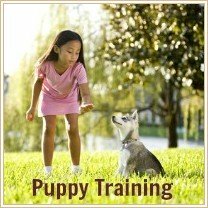 Unfortunately many puppy owners are so surprised by, and unprepared for, adolescent puppy behavior that they either believe that there is something 'wrong' with their puppy, or find the whole stage too frustrating and difficult to deal with. Re-home him, often with a stranger and with no real idea of whether the new home is safe or suitable. Banish their puppy to live outside where he is out of sight, and out of mind, living a lonely, and often very uncomfortable, life. Most dogs are surrendered to local shelters or dog pounds when they're aged between five months and two years. This exactly corresponds with the teen puppy stage. When it came to the reasons why a pet was being rehomed or surrendered, 46% of owners cited 'Pet problems'. Most specifically, 'aggression, destruction or health problems'. At least two of these are usually found during puppy adolescence. Bratty behavior, general disobedience and the occasional potty accident are fairly mild teenage issues. Bullying, dominant behavior (such as picking on a family member or other pet) and resource guarding are more serious problems. Luckily, all adolescent puppy behavior can be discouraged, and eventually eliminated, by following a few simple guidelines. For a puppy who suddenly seems to have forgotten every obedience training command he ever learned, develops a stubborn streak, or gets all mouthy and excitable and won't calm down.... the best remedy is consistency and patience, and lots of love. Oh, and a sense of humor doesn't hurt! Even when you're frustrated it's important to stay calm and to be patient when correcting him and to keep the house rules (and corrections) consistent. If you change the rules daily/weekly, or each member of the family has a different interpretation of them, your little guy will be confused, and that confusion will make him anxious. Puppies crave routine and predictability, it helps them feel safe and secure. During the adolescent stage your pup is in the 'eye of the storm' as far as emotions go, so it's even more important to make sure that he has routine and security to keep him grounded. It's also important to make sure little Fido knows that you love him, no matter what. But this doesn't mean that you spoil him, or let him get away with bad behavior. Continue to play games, go for walks, snuggle on the sofa. Even after a trying day. Some adolescent pups go beyond being a little 'bossy' or 'opinionated' and try to rule the roost. 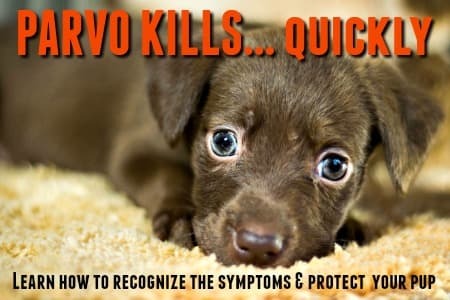 If Fido's adolescent puppy behavior extends to him trying to control the behavior of any human family members by growling, snapping or intimidating them, this is a huge NO-NO and needs to be dealt with quickly. He must not be allowed to dominate other dogs or pets in this way either, at home or when out and about. Sometimes it's just one family member (often a child, or someone who is older, weaker or whatever), other times a puppy can decide he's King of the Hill and everyone should bow down to him. Either way, this simply isn't on. There's something that can really take the 'edge off' anxious, combative behavior and help calm a pup who is going through a challenging time or in a situation that makes him generally fearful. These are totally natural chemical compounds produced by animals which produce behavioral responses. Pheromone Collars and Pheromone Diffusers are simple and safe to use and are amazingly effective in helping a pup or dog to feel calm, relaxed and happy. Emotions that can be in short supply in teenage pups. We use these regularly in our home and I recommend them often. At the first sign of bullying/dominant behavior you need to correct your puppy firmly, but lovingly. A verbal correction, accompanied by a quick, firm (but not rough) shake by the scruff of the neck (this is how an adult dog would reprimand a puppy, and Fido will get the message loud and clear) is usually enough. But remember you need to keep the correction consistent, and don't let him 'get away with it' even once. He needs to know that this behavior is forbidden. Don't expect the first 'telling off' to win the war. Puppies, especially teenage puppies, can be very stubborn. You will need to be patient and consistent, it's a war of willpower, and yours needs to be stronger than Fido's. This goes for everything from food and treats, to walks and games. Ask Fido to 'sit' or 'down' before giving him his food, or playing a game, or clipping on his leash etc..... and make sure he obeys before he gets whatever it is he's waiting for. I mean this is the most basic sense.... ie that you must not allow your pup to lie/sleep on beds or furniture. In the canine world, a physically elevated position is symbolic of an elevated social position. So if Fido feels that he has a right to claim his space on the sofa, then he may also feel that this makes him equal in rank to the humans sitting on that same sofa! This is literally what it sounds like - you feed Fido his kibble by hand, either one piece at a time, or a palm-full at a time. Everyone should do this, even little children can do it with some adult help. Dogs respect those who control the resources of their lives, and food is a biggie. This also helps to head off food-guarding issues as your pup becomes totally familiar with human hands, and his food, being in close proximity. Make sure everyone in your home participates in teaching your pup basic dog obedience commands to make sure that Fido understands that he must obey any human, at any time. The 'Leave It!' command is one that every puppy/dog should know. It also helps prevent resource guarding behaviors by teaching your pup that he must give-up any object (even an edible one!) if you ask/tell him to. Enrolling your puppy in at least one basic obedience class is really a must. It helps strengthen the bond between you, gives you access to hands-on help with any problems that arise, and is a great socialization experience for Fido. Socializing your puppy should start early, and continue throughout his lifetime to prevent fears or anxieties developing later on. Just because little Fido loved car rides and wasn't phased by traffic when he was 12 weeks old, if he spends the next six months without setting paw outside his home he's likely to be pretty leery of both (and everything else) by the time he's nine months old. This should be fun for both you and your puppy and is a great way to get some exercise, mental stimulation and a break from routine. For plenty of suggestions and ideas for social outings for you and Fido, check out my Puppy Socialization page. And that's it.... your guide to adolescent puppy behavior... and how to survive the teenage stage. Remember, above all this is a 'STAGE', and it will pass. As long as you give your pup what he needs in terms of stability, discipline and love, he will grow into a well-behaved, confident and friendly dog who is a pleasure to be around.